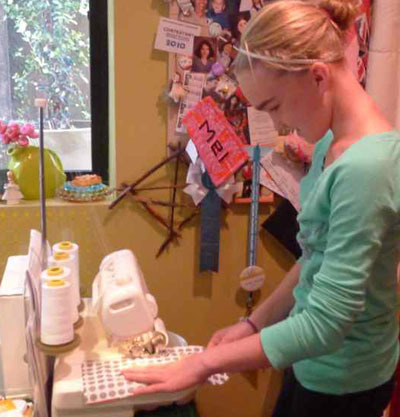 Melanie McFarland – artist, author, quiltmaker, and BERNINA National Artisan – sent pictures from a recent sewing day with her niece. Adorable! 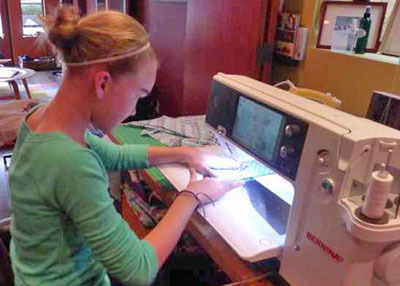 I started sewing when I was about 11 years old, too, but didn’t use a serger until I was in my late 20s. Now they’re my favorite machines. Way to go, Kinsley! Can’t wait to see what you stitch next! 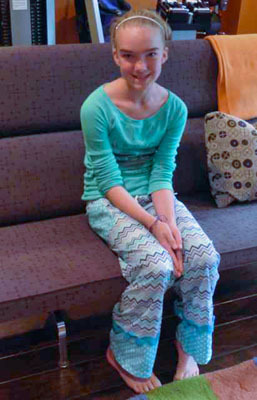 Last month I had my 11-year-old niece Kinsley visiting from Texas. While she was here, she made pajama pants and a couple of pillowcases. I had planned to put my BERNINA 830 away and take out my aurora 440 or even the BERNINA 380, figuring these machines would be easier for her to use, as she has sewn on both. Well, I guess I was lazy, and I left it out, and she did beautifully on it!! If an 11-year-old doesn’t have any trouble using it, I shouldn’t, either! She also used my BERNINA 2500DCET serger. 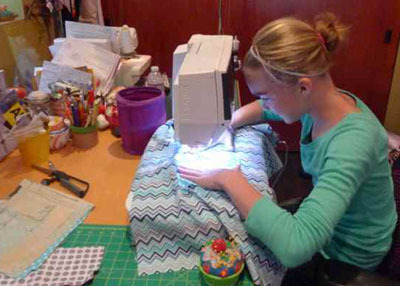 Kinsley sewing a pillowcase on Melanie’s BERNINA 830 sewing machine. Serging on the BERNINA 2500DCET – it’s fast! 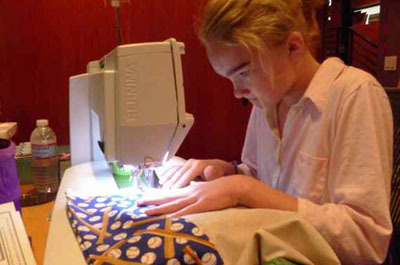 Moving on… sewing pajama pants. Adding decorative cuffs and trim.